Moby in Sebastopol, CA – ADOPTED! 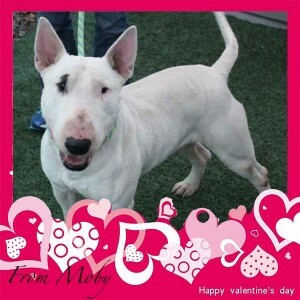 | Bull Terrier Rescue, Inc.
← Jack in Sebastopol, CA – ADOPTED! Moby in Sebastopol, CA – ADOPTED! Handsome Moby is quite popular with the Bull Terrier girls at the kennel! He’s about 2 years old and weighs in around 62lbs. His energy level is moderate but he’ll match your activity level as he loves playing with Brownie who can be very rowdy. He’s been very polite with the other kennel dogs. This sweetie is crate trained but will need a bit of a refresher on crates and leash manners. If your information is not yet on file, please complete our application which can be found here: http://www.bullterrierrescue.org/?page_id=572.